A research project that began in 2016, due to a realisation that the subject area is far more complex than originally envisaged, the scope of research has been considerably expanded. Perceptions of certain areas of the subject have also become somewhat distorted due to them having fallen victim, if you will, to various focussed marketing ploys, mainly connected to the tourism industry and the city of Kaifeng-fu; a more accurate and detailed perspective needs to be established to counteract this. 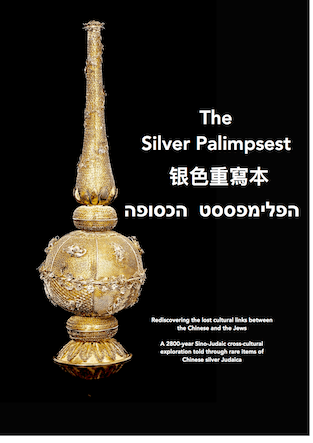 To learn of the existence of ceremonial items of Judaica within the 285-year Qing Dynasty decorative silver repertoire may initially seem incongruous; the reality is that it could not have been a more logical phenomenon. In the context of influences brought to bear on Chinese silver-making techniques and style, Jews had a 2200-year history with China that dated back to the Han Dynasty. In the context of a trading history with China, Jews had a legacy that dates back even further to the Zhou Dynasty/Warring States – a time when Phoenicians very much ruled the waves of the Levant [eastern Mediterranean] along, surprisingly, with their fellow Semites and neighbours, the Hebrews. In the context of silver-making, Jews have a tradition of being masters of the art of silver-making for at least 2200 years, as do the Chinese; with a mastery of trading, they had some 2800 years. Jews had been merchant traders both by sea and by land with China since the collaboration of King Solomon and the Phoenicians [956-931 BCE]. Himyarites, Rhadanite, Sassanian and Khazarian Jews followed, using the Spice Route [aka Maritime Silk Road] and the overland Silk Road, to be joined later by the Baghdadi Jews . A highly sophisticated network of Jewish trading posts developed along the entirety of the Silk Road, including Bukhara [Almaty; Astana; Pavlodar; Karaganda, Chimkent; Semey; Kokchetav; Dzhambul; Uralsk; Aktyubinsk] Uzbekistan [Samarkand], Turkmenistan [Merv], Tajikistan [Dushanbe], Kyrgyzstan [Osh, Fergana], Kazakhstan [Taraz] and Mongolia [Ulaanbatar]; early trade documents in a unique form of Hebrew from the area dating from around 400 CE and Judaeo-Persian documents from the 8th century CE have been found in China that suggest the community was not only in existence, but thriving by that time. Jews, from the Sung Dynasty onwards, settled in China.